Snowshoeing at Norikura, Kamikochi. It’s great fun!! Do you want to see the beautiful winter view of Japanese alps ?? Ski and Snowboarding is just one of winter activity in Here Norikura Kogen. Recently, Snowshoeing is getting popular in winter activity and snowshoeing is easier than ski/snowboarding and anyone easy to start the snowshoe. Here Norikura kogen and Guesthouse Raicho are best field to enjoy the snowshoeing!! Now We’d like to explain the reason of the best field. 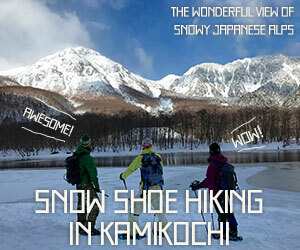 Guesthouse Raicho will rent a snow shoe and organize a snow shoeing tour!! Norikura Kogen is located in Chubu Sangaku National Park and there are many hiking trail to see the beautiful waterfalls and ponds around 1400m ~ 1800m above sea level. These hiking trail become snow shoe hiking trail in winter season. ※Depend on the snow condition, you should wear not snow shoe but trekking shoes and light crampon. The entrance of trail to Zengorou fall is just in front of Guesthouse Raicho!! It takes 25min to Zengorou fall. Everyday figure of ice fall is changed due to temperature. Night snowy hiking to Zengorou fall is also beautiful!! Guesthouse Raicho will hold a Night snowshoeing tour to see Zengrou fall in winter season!! Detail is written later. Other trail and view spots. There are many small beatiful ponds and meadow strip in Ichinose Enchi. During winter season, bus is suspended and all shop and hotel are closed at Kamikochi. However, we are able to go to the Kamikochi by walk!! Kamikochi is very beautiful and popular for foreigner in spring, summer and autumn but I highly recommend to go in winter season. Because the view of snow and Japanese alps are amazing and there are no people. Silence Kamikochi is hidden scenic spot. You can get beautiful mountain view all to yourself. However if you want to see the amazing view, We need to go up and go through the some long tunnel. Guesthouse Raicho started to rent a snow shoe for the guests to enjoy the winter activity more. If you have trekking shoes, we will lent a over shoes which cover the trekking shoes in order to avoid the snow. If you have snowboard boots or snow boots, just wear the snow shoe. ・Price　3,000yen per person for the guests staying at Raicho. ※There is also private tour. For detail please contact us. ・Price　5,000yen per person for the guests staying at Raicho. ・Raicho→Ski Lift→Sanbon waterfalls→Ushidome pond→Zengorou fall or Ichinose Enchi. ・Price　9,000yen per person for the guests staying at Raicho. 10:30 Taisho pond and if we have time go to Tashiro Pond. ※One day tour is also available for the guests who want to go to kappabashi bridge. It will be charged additional 4000yen per person. We look forward to see the beautiful winter view with you. Please refer to the below post for other winter activity. Let’s enjoy Mt Norikura snow resort.